I think it’s got a shot at 6th, maybe 5th. Impressive regardless. The Conservancy has 8.2" as of the 1 AM update. Given 0.17" qpf and 32 degrees, the added 1.5" seems reasonable. The 2017-18 seasonal snow total is now at 35.2", making it the 43rd snowiest season on record. Using the 0-9 decadal system and starting with the 1870s, the 2010s is now the 2nd snowiest decade on record (340.3") behind only the 1890s (352.3"). Also, if no snow fell the rest of this March and the two Marchs following this (God forbid), the 1991-2020 March snowfall average will increase from 3.9" to 4.6". Also, barring snow revisions, this is the third time the last four years that March ends up snowier than December, January, or February. Finally, after this wonderful time we had tonight, how about a shoutout to amugs, who was on board this system since early last week and never let go! With 8.4 inches of snow, this storm is the 7th largest springtime snow in NYC history. This also brings the March snowfall total to 11.6 inches beating the 11.2 inches that fell in January. This is now the the 3rd time in the last 4 years that March will be the snowiest month of the winter season, provided we don't get a big April surprise. This also brings the seasonal snowfall to 35.4 inches making it the 5th straight year NYC surpasses 30 inches. 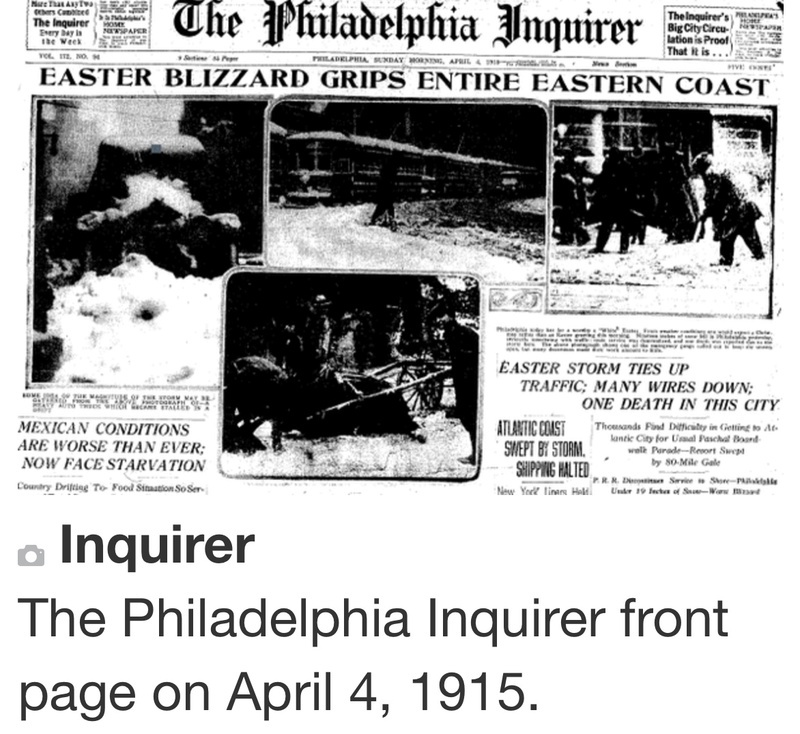 The only other time that happened was the winters of 1880/81 through 1884/85. This also brings the 1991-2018 seasonal average to 30.8 inches. NYC needs 43.7 more inches of snow between now and Dec 31 2020 to have an average seasonal snowfall of 30 inches or above when the new averages are calculated for the 1991-2020 period. This would be the first time since the 1891-1920 average of 32.2 inches, that the seasonal average would be greater than 30 inches. Using the temperature projections for the rest of the month, it is highly likely that for the second straight year, March is colder than February. If the temperatures on the WABC 7-day forecast verify verbatim, the March average would be 40.0, two degrees below the February 2018 average and 2.5 degrees below the 1981-2010 March average. By the way, for whatever reason, all of the monthly temperature averages used by Upton are several tenths of a degrees below what the actual monthly average temperatures were. In this instance, Upton's 1981-2010 March average is 42.5. However, when you take the average of the 30 March's from 1981 to 2010, the average was really 42.9. Upton's 1971-2000 March average was also 42.5. However, the actual 1971-2000 monthly average was 42.8. Now, let's suppose they do indeed shave off a few tenths of a degree from the averages. As I mentioned, the actual 1981-2010 March average was 42.9. If the March 2018 mean is 40.0 as I mentioned, then the 1991-2018 March Average would be 42.5. In order for the 1991-2020 March average to overtake the 1981-2010 March average, The 2019 and 2020 March's need to average 47.5 degrees, in other words, blowtorch March's like 2012 and 2016. Speaking of which, The 2012 and 2016 March's are the only March's since 2011 to be above average. Math23x7 wrote: Using the temperature projections for the rest of the month, it is highly likely that for the second straight year, March is colder than February. If the temperatures on the WABC 7-day forecast verify verbatim, the March average would be 40.0, two degrees below the February 2018 average and 2.5 degrees below the 1981-2010 March average. Nice stats. It seems our springs are consistently delayed. Great work Mike and thanks for sharing. I’ve started to notice the last few years that every season seems to be starting about a month later and lasting a month longer. Oh sure Mike posts stats and everyone jumps on board the weather stats thread. Smh. With the 5.5 inch total at 10AM in Central Park this storm takes the 8th spot among April snow storms in NYC. It would be pretty cool to put two on the list in the same year. Maybe next weekend? This seasons snowfall in NYC now stands at 40.9 inches with the additional 5.5 today. The average seasonal snowfall since Jan 1991, which is the starting date for the new 30 year averages when they are calculated through December 2020, is now 31.0 inches even broken down by month as follows. The individual months equal 30.9 when added together because a couple of months round down. CPcantmeasuresnow wrote: This seasons snowfall in NYC now stands at 40.9 inches with the additional 5.5 today. CP, I would like to know the average temperatures of that 1891-1920 stretch versus the 1991-to recent temperatures for comparison. I can give you the Dec-Feb average as that's all I have. Mike might have the temperatures for March which sees almost the same average snowfall as December so should be averaged in. The average temperature for December through February 1891-1920 was 32.3 degrees, for the 1991-2018 December through February we're averaging 36.0 in NYC. Almost a 4 degree average increase with almost the same amount of snow. Thank you CP for that info.Not that I am a believer of the Global Warming Theory, but they do claim that there would be an increase in large snowstorms as a result.Had the temperatures from 1991 to recent matched that 32.3 from 1891-1920, it would make the GW theory less believable.Anyway, great stats from you and Mike on the snowfall and temperature data. Doc. I believe in global warming. The data is indisputable. However I DO NOT BELIEVE IT HAS TO DO BECAUSE OF MANKIND. There have been dozens of periods over millions of years scientifically documented where the earth warmed then cooled. I BELIEVE ITS ALL NATURAL AND CYCLICAL. With the 5.5" from the Conservancy today, the 2017-18 seasonal snow total is now at 40.9", the 33rd snowiest on record. Also, using my Excel chart I have available, this now goes into the "above normal" category. Revisiting my post from three years ago, Central Park began snowfall measurements in 1869. In the final 31 years of the 19th century, there were 10 seasons with at least 40" of snow, In the 20th century, there were 17 seasons with at least 40" of snow. So far, the 21st century has had 9 seasons with at least 40" of snow and we're only 18 years into the century. Pretty nice time in the Park today taking lots of pictures. Even if the potential snow events the weekend and next week don't deliver, this was a pretty good snow season. Using the 0-9 decadal system, CPK needs an additional 6.4" between now and the end of 2019 to surpass the 1890s for the snowiest decade on record. Here's to hoping mother nature doesn't prevent that from happening. Now, regarding the 1991-2020 average, if no snow fell between now and the end of 2020 (god forbid! ), the yearly average would be 28.7", up from 1981-2010's 25.8." Here by the way is that post from three years ago. Note that not only did CPK get another snow event (3/20/15), it also got revised snow totals from three (obvious) undercounts to put it at over 50" of snow. I have seemed to discover some irregularities with the temperature measurements at CPK from the late 1800s. I have been gathering data and once I finish inputing it, this could be a crack in the data we have been using and may prompt us to rethink all of the observations during that time. Stay tuned. Central Park made a snow measurement of 6" today. The makes this the earliest 6"+ snowstorm on record. The old record was November 24th-25th in 1938 when 8.8" fell. Math23x7 wrote: Central Park made a snow measurement of 6" today. The makes this the earliest 6"+ snowstorm on record. The old record was November 24th-25th in 1938 when 8.8" fell. The key word there is official Mike. Many parts of NYC saw 8 inches in the November 6-7 2012 post Sandy Storm. Central Park of course measured 4.7 in that storm. NYC now needs 32.2 inches of snow between now and Dec 31, 2020 so the new 30 year average will be 30 inches plus. Right now the 28 year average is 31.2 inches. Below is the average snowfall for NYC (Central Park) per month since January 2010. Just a shade under 40 inches per season. January and February have been carrying the load. The other months are all very near the 150 year average. Yesterdays 6.4 inches of snow in NYC becomes only the 5th November storm of 6 inches or more. It also becomes the 193rd storm of six inches or more since records (1869) have been kept.